I know a lot of my posts have been about how holidays are celebrated in Israel, but I hope you’ll bear with me through one more. I promise, no more! Last week we celebrated Shavu’ot – the “Festival of Weeks” and the forerunner to Christian Pentecost. Like most Jewish holidays, it was originally an agricultural celebration, marking the end of the wheat harvest, but was Rabbinically associated with the giving of Torah at Mt. Sinai. While the other two Pilgrimage holidays (Pesach and Sukkot) have special rituals that do not need to be performed at the Temple, Shavuot is entirely Temple-dependent. The main event of the day was to present “first fruits” at the Temple, but now without a Temple, the holiday had to be reinvented as a celebration of Torah. Instead, people stay up all night studying, and then perform the morning service at dawn. 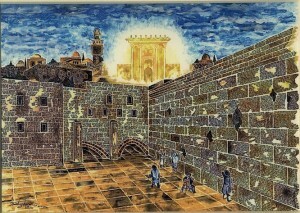 Being here in Jerusalem for Shavuot was particularly meaningful, as the site of the destroyed Temple. After dinner, several of my friends and I went over to Pardes, where we attended a fascinating class taught by one of my teachers, Judy Klitsner, on “Aveira goreret Aveira” (one sin leads to another) through the story of Achav’s theft of Navot’s Vinyard in the Yizr’el Valley (I Kings 21). After that, we went to a class by a Gemara teacher from Hadar about the connections between Elisha ben Avuyya (aka “Aher” – the apostate), and the Book of Ruth, which is read on Shavuot. After doing some independent learning on Hoshea, we left at around 4:30 in the morning. While staying up all night studying is great, it can be done anywhere. What was special about this Shavuot was that we were in Jerusalem, where Ancient Israelites used to travel to from miles around every year. So when we left, we joined tens of thousands of other people throughout Jerusalem walking up to the Old City. The stream of people lead us from Emek Refaim down into valley west of the city, and up a path to Mt. Zion, where we entered the old city through the Zion Gate. From there we followed the crowds down to the Kotel, the closest that Jews are allowed to the Temple Mount. Most people stopped at the Kotel, but we continued down a bit to the Southern Wall excavations, under Robinson’s arch, an ancient staircase that led up through the Royal Palace courtyard and into the Temple. Because of the Haredization of the Kotel, this is the only place where men and women are allowed to pray together. It was much quieter here, with only 50 or so people, and everyone together in one minyan. While the other two Pilgrimage Holidays have certainly gained something by retaining non-Temple related traditions, there is something unique about celebrating Shavu’ot in Jerusalem. Over the course of Pesach and Sukkot, I never made it up to the Old City, because there was enough ritual to keep me occupied at home in Baka. I honestly could have celebrated those holidays in Tel Aviv or Haifa without noticing the difference. The lack of other obligations on Shavuot, however, allowed me to experience the holiday in a glimmer of its original sense as a pilgrimage to the Temple. The early morning ascent up Mount Zion, and then shacharit amongst the ruins of Robinson’s arch was far more meaningful than anything I had experienced at home. In a way, we gained something from being excluded from the mess at the Kotel plaza. We had a quiet prayer service directly in front of the Temple Mount, all amongst the stones of the fallen arch and the ruins of shops on the ancient Tyropoeon street. The Kotel may be closer to the Temple, but it has been sterilized and cleansed of any reminder of destruction. There is certainly something to be said for being reminded of the reasons why we no longer have Temple holidays during our reenactment of them. Hopefully, I will be able to return to Jerusalem for future Shavuots, as this seemed to me to be really our only remnant of pilgrimage left in Judaism.